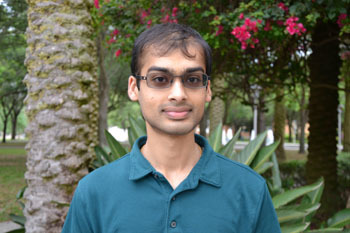 TAMPA, Fla. -- Sanil Reddy of the University of South Florida has been awarded the Critical Language Scholarship (CLS) to study beginner level Hindi in Jaipur, India for eight weeks this summer. The Critical Language Scholarship award is fully funded by the United States Department of State, Bureau of Educational and Cultural Affairs. The award also provides an orientation in Washington D.C. and language courses abroad during the summer of 2015. Reddy, an Honors College junior majoring in environmental science, has participated in undergraduate research projects at USF and the University of Pennsylvania. Through his research endeavors in the Department of Mathematics and Statistics at USF, he has published in the Undergraduate Journal of Mathematic Modeling and presented at the STEP Up for Applied Calculus Conference and the Undergraduate Research and Arts Colloquium. During the summers of 2009, 2011 and 2013, he participated in undergraduate research experiences at UPenn in its Center for Magnetic and Optical Imaging and the F.M. Kirby Center for Molecular Ophthalmology. Reddy is also a Calculus I & II tutor and an Engineering Calculus peer leader in the Department of Mathematics and Statistics. He has been involved with Bulls for Moffitt since 2012, serving as its advertising chair, secretary, outreach coordinator and now as their current president. He also has served as the secretary and president of the Microbiology Club and is a member of the National Society of Leadership and Success and the National Society of Collegiate Scholars. He currently volunteers for Moffitt Cancer Center and Camp Boggy Creek, and in 2012, he shadowed and volunteered in mobile health clinics dedicated to supporting elderly rights to equal healthcare and benefits in Delhi, India. Through the CLS program and the Hindi language skills he will obtain, Reddy hopes to design a program that will form an agreement with rural communities to teach Hindi and introduce cultural activities to student volunteers, while they receive medical assistance. Such a program will involve education on disease prevention, requiring versatility in writing and speaking Hindi. He plans to annually visit Hindi and Telugu speaking regions of India to expand his linguistic and cultural knowledge, and continue the program for students and villagers. The Critical Language Scholarship offers fully-funded, group-based intensive language instruction and summer language institutes for U.S. university undergraduate and graduate students to study 13 critical foreign languages for the summer term in locations where the language is natively spoken. The selection process is administered by the American Councils for International Education and The Ohio State University/Ohio University with awards approved by the US Department of State, Bureau of Cultural Affairs.